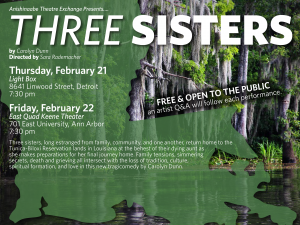 Anishinaabe Theatre Exchange artists will be in residence at the University of Michigan campus from February 16-23, 2019, culminating in two performances of the new play by Carolyn Dunn, Three Sisters. The Anishinaabe Theatre Exchange uses theatre to activate networks with Native communities in the Great Lakes region. The group is a consortium of people from various backgrounds working to promote dialogue about Indigenous culture and issues. 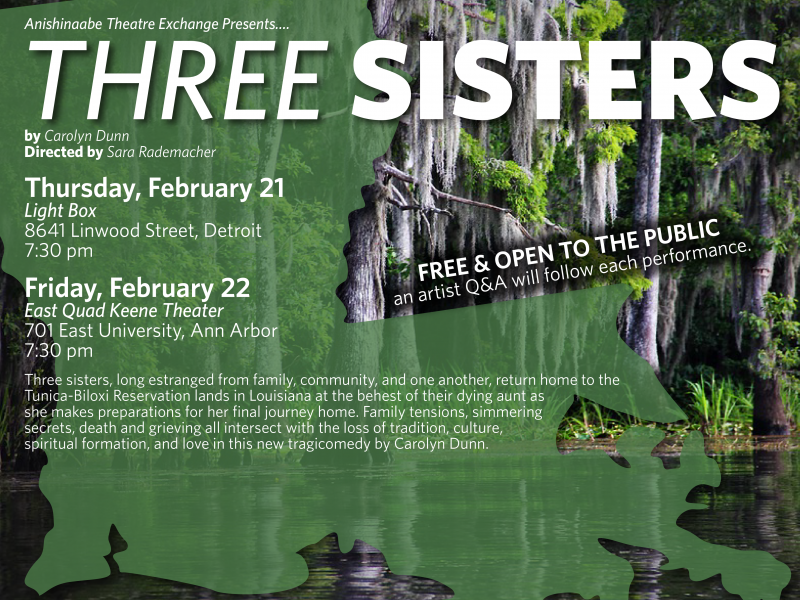 In this brand new tragicomedy by Carolyn Dunn, three sisters, long estranged from family, community, and one another, return home to the Tunica-Biloxi Reservation lands in Louisiana at the behest of their dying aunt as she makes preparations for her final journey home. Family tensions, simmering secrets, death and grieving all intersect with the loss of tradition, culture, spiritual formation, and love. Poet, playwright, and scholar Carolyn Dunn was born in Southern California and is of Cherokee, Muscogee Creek, Seminole, Cajun, French Creole, and Tunica-Biloxi descent. Her scholarly work focuses on American Indian women’s literature and American Indian identity, and her play The Frybread Queen was produced by the Montana Repertory Theater in Missoula, Montana, and Native Voices at the Autry in Los Angeles. Her collections of poetry include Outfoxing Coyote (2001) and Echolocation: Poems and Stories from Indian Country L.A. (2013). All events are free and open to the public. Visit www.lsa.umich.edu/world-performance for more info. If you are a person with a disability who requires an accommodation to participate in this event, please contact Center for World Performance Studies, at 734-936-2777, at least one week in advance of this event. Please be aware that advance notice is necessary as some accommodations may require more time for the University to arrange. This residency is co-sponsored by the U-M Residential College, CEW+, Institute for Research on Women & Gender, SMTD Department of Theatre & Drama, Institute for Humanities, SMTD Office of Diversity, Equity & Inclusion and Department of American Culture.